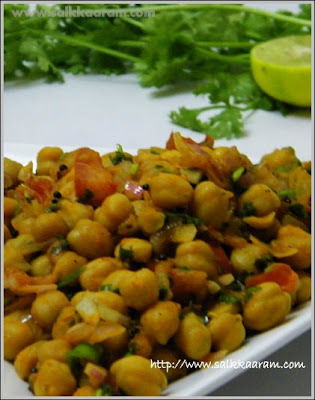 Chickpeas Salad / Chana Chaat | Simple and Delicious ! Blogging has given much pleasure, especially if I see my family enjoying the dishes I prepared.. My Guru cook, mom has been a great fan of this chaat, I prepared without a chaat masala. She stopped making curries for chappathi and says this is enough! :) She loved chutney sandwich and fish molee too from my blog,thats enough for encouraging me..Chana chaat was an usual iftar snack we used to buy from Dubai restaurants, which I don't know the exact recipe, but I tried to please my self once, when I craved for some spicy pungent taste..! For my surprise, everyone loved it and it has been a common dish served with chapathi. Soak chickpeas in water for whole night. Wash well and mix with salt,coriander powder,chilly powder and turmeric powder. Cook it in enough water. Don't add too much water for cooking. When the chickpeas are done, open the lid and reduce the excess water by cooking for a while. Chop onion, tomato and green chillies. Heat oil, allow mustard seeds and cumin seeds to splutter. Put half of the chopped onion and tomatoes in this. Saute for a while, then add the cooked chickpeas into this. Add pepper powder, lemon juice, the remaining half of chopped onion and tomatoes. Add chopped green chillies and coriander leaves and mix well. If needed, add little salt. That is a healthy and delicious snack Seena! Seena, sounds like a delicious salad. 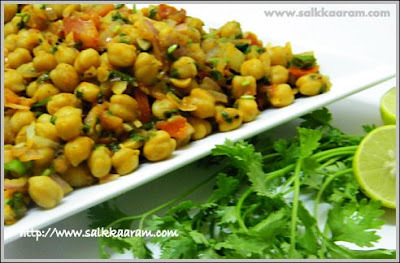 I am a big fan of chickpeas, a staple in our cuisine, and tihs recipe is very appealing to me. Yum! Healthy salad Seena. I also make channa chat. salaam,i have been a regular visitor of u'rs for long ... have tried many of u'r recipes and all came out well...thanks a lot seena.. do u have the recipe for neypathal? Thanks for letting me know,wish to see you again here.. I had posted recipe of ney pathiri / ney pathal, you can see it on right side bar, in the previous posts list, or check the kerala pathiri recipes on left.. Enjoy and keep trying out more..
Wow...looks really good! I am sure it tasted really good with rotis! Your recipe helps people who are really health conscious. a very wonderful snack recipe. like they said health is wealth. There are lots of ways to cook veggies deliciously! Try the vegetable recipes at tanya's site, I liked them! This is one of my all-time favourite ways of having channa. mmmmmmmmmm one of my fav one.. looks so yummy and delicious.. so healthy too.. Tried this recipe. came out well. Tried your recipe and it was great for a first time experience. just added some tomato sauce and it was tasty.